The M23 Vigitherme is a very thin model : 6,5 mm. The two picot edges allow a direct mounting on a printing circuit with a pitch of 7,62 mm. 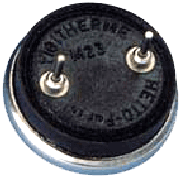 The M 23 Vigitherme can be optionally equipped with the stainless steel V34 small plate which can to be attached by mean of two screws.